Seams: Body - Barely visible, barely felt seams traveling the length of the body, up and over the stem and back down the other side. Rim - A seam is located on top of the rim but has been cleaned up well. Overall Impression: This cup is a good example of a company who pays attention to details and listens to what their users need and want. 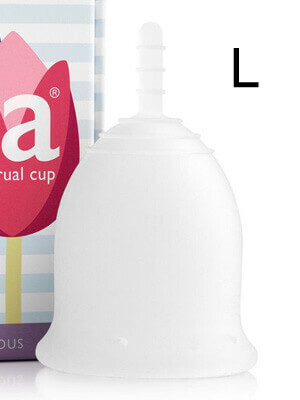 The Lena Original is one of the longer bell shaped cups on the market. The large should be comfortable for someone with a medium to high cervix. Take into consideration that bell-shaped cups with flared rims tend to ride up and sit higher in the vaginal canal/fornix and the total capacity may be less than what is listed if the cervix sit deeply into the cup. This is one of the firmer bell shaped cups with a flare rim on the market.